Just State Flags New Jersey State Flags are in stock in all sizes. Save up to 15% on 2-flag Sets each with American and New-Jersey Flags bundled in a a variety of size combinations to save you money. New-Jersey Presentation Sets are for indoor display, as well as outdoor parades and ceremonies. From 7' to 9' Heights. 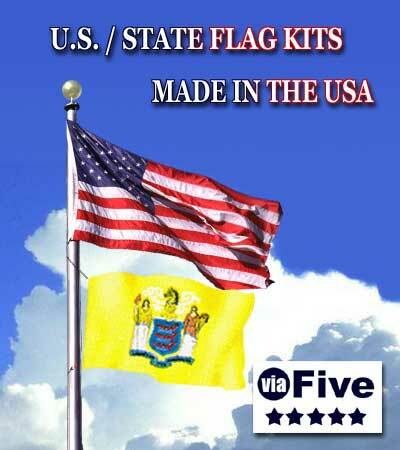 New-Jersey Flag Pole Sets feature Five Star Flags exclusive Stainless Steel single piece pole kits. New-Jersey State Flag History Homework and Legal Help can be found at the Flags of the World Site. Click here if you need help in New-Jersey to retire your American flag. These premium US Flag and New Jersey State Flag Sets feature top-of-the-line US-made flags for durable flag flying.